At the risk of alienating and even antagonizing a large portion of my audience, I must make a confession: I am not a cat person. This is a personal thing that one day I plan to write about on my memoir blog Wrote By Rote. For now I'll just let it be known that I am not particularly fond of cats. 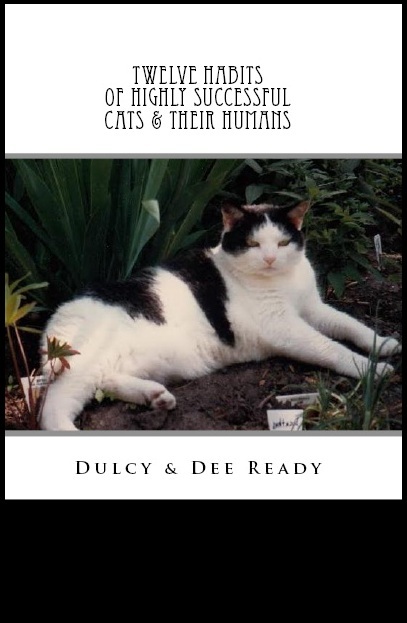 For this reason, it was with some reservations that I agreed to read Dulcy and Dee Ready's Twelve Habits of Highly Successful Cats & Their Humans when the author offered to send it to me to see if I would be willing to review it. Since Dee was responsible for one of the more popular guest spots at Wrote By Rote, her story of her first book A Cat's Life; and since I have always enjoyed the writing at her blog Coming Home to Myself, I felt like I should at least give her book a chance. Besides she asked so nicely and wasn't holding me to any obligations of a review that I couldn't turn down her offer. In all honesty, I had low expectations of this book. I anticipated some cloyingly annoying animal story with all kinds of cutesy-isms and boring pet talk. Instead what I found in this short book was an enthralling story of love and devotion and a philosophical study of what it means to be truly alive. Presented in a format similar to a self-help book, there are twelve sections corresponding to each of the twelve habits related to topics such as uniqueness, constancy, listening, acceptance, grieving, and others. Each habit is first explained by the superior being, a cat named Dulcy. Then the cat's human relates the life lessons she has learned from Dulcy. This back and forth approach is done in a charming and very effective manner. Both cat and human provide exemplary anecdotes and observations that clarify each topic for the reader. Dee has done a commendable job of creating the distinctive voices of the cat and the human, filling each with enough humor and pathos to provide a well-rounded presentation that will entertain and enlighten. With only seventy pages, this is a quick read that many will be able to do in one sitting. However the beauty of a book like this is that you can pick it up and open to any page and start reading and gain pleasure. It's the kind of a book you will probably be tempted to keep nearby to just read a snippet here or a habit there for inspiration. There is much wisdom in these pages and Dee has written it well. If you are a cat lover I can almost guarantee that you will love this book. Anyone who enjoys animals will undoubtedly like this book. Even non-pet people like me who enjoy good writing will highly appreciate this book. Twelve Habits is as much about people and their relationships with other people as it is about cats and the people they choose to be with. The book can be read in an allegorical sense that can be helpful as much as it can be a fun read. My recommendation is that you buy a copy of Twelve Habits of Highly Successful Cats & Their Humans for yourself and extra copies for the cat lovers that you know. This book would make a wonderful gift and it's inexpensive enough that it won't break you. If you read Twelve Habits of Highly Successful Cats & Their Humans, I'd love to hear what you have to say about it. As for me this book almost made me wish I liked cats. Heck, it actually made me wish I were a cat who had a nice human to keep me company. In this inspirational self-help book, an enterprising feline named Dulcy mews twelve stories that, if applied by other cats, can help them find nirvana with their humans. In an accompanying meditation, Dee helps human readers apply the habit to their own lives so they, too, can find the peace and contentment of a life well lived. The author provided me a free copy of Twelve Habits of Highly Successful Cats & Their Humans for my honest review. The above is my true opinion about this book. One either like or don't like cats. Personally I love them had one for 14 years, she had diabetes and needed 2 shots of insulin daily. She was sadly missed when I had to part with her. I wish Dee all the best with her book. I love that cover and title. I'd pick it up for that alone. Good luck with Dee's new release! I think that I personally prefer dogs so don't worry Lee, your opening statement in this post doesn't bother me. This book sounds interesting, like you say I'm not sure if I would like it but then it sounds pretty good from the review so I'm not too sure haha. I'm a dog person and I love wondering what's going on in my furry family member's head. This sounds like a book I'd really enjoy. Thanks for pointing my toward it. What??? You don't like cats? We need to have a talk. It's true, some people like the craziness of felines and some don't. I love both dogs and cats but when cats have owned me, they tell me what to do and that's never good. I need to pick up a copy. Creative. I admire writers who can write from a pet's POV and not have it come out hokey sounding. I hadn't heard of this one so thanks for bringing it to my attention, Lee. I was thrilled to see that you had posted a review of a book today, as I have never done one before, recently committed to writing one, and needed to know how it is done. And what happened as I read your post is that I became almost desperate to read the book. I guess I learned that that's how you write a review! Thanks! Yvonne -- Dee's fans loved her first book so I think this one will also do well. KarenG -- Cat lovers I'm sure will adore the cover and title. I would not have been drawn in by it and would have missed a wonderful little book. Yeamie -- I'm more of a dog person as well. The book can be read on a level that goes beyond cats and relationships with them. It is a book about love and lifelong faithfulness. Suze -- :) This is another case of not being able to judge a book by its cover, title, or subject matter. I was surprised. LD -- I think Dee does an extraordinary job of getting inside Dulcy's head--it was quite believable. Teresa -- I think you would appreciate this book. I will tell my story about me and cats one day. Sia -- Dee Ready pulls off the POV extremely well. Elaine - Thank you for the compliment. Reviews are very personal and that's the point. Write it from your heart, but don't forget your mind. My review is not an intense scholarly examination, but just my thoughts on the book and how it affected me. Dear Lee, thank you so much for this lovely review of the companion book to "A Cat's Life: Dulcy's Story." From your review of the first book, I never would have known that you weren't a cat person. To be able to put aside a bias and write objectively is a great gift. Your review of "Twelve Habits of Highly Successful Cats and Their Humans' is so appealing to me. I'm glad that Dulcy's POV worked for you and that you found some wisdom in her "mews" and my musing. It sounds like an interesting book and a unique take on a self-helper. I think I'd enjoy that. Although I always thought the only successful habit a cat needed was persistence to find a sucker human to care for it. Well, as a cat lover, it does sound like a cute book. Thanks for reviewing it! Dee -- I was delighted to read and review this book. Your writing made reading without my cat bias interfering an easy thing to do. Southpaw -- For me this book works best as a self-help book of encouragement and good advice on relationships. Alex -- That is part of the message in a way though Dulcy says it more more poetically and with greater tact. Cherie -- You would probably enjoy it. Elisa -- It's one of those books that is filled with wonderful little gems that you find new meanings in each time you run across them. Sharon -- I heartily endorse this book. Debra -- I hope you will share your thoughts about the book after you've read it. Cats might be an acquired taste, something like Port Salut Cheese. Anyway, I doubt that anyone will hold it against you for being honest about cats or the book. Thanks for the review. Thanks for being open-minded about the book and for sharing your review. It sounds like an interesting book. I'll have to check it out. Well, I suppose I should read this little book then, since I am a cat fan and I'm currently 0wned by two cats. hehe. Trisha -- I think most hard-core cat lovers will also love this book. Actually I'm not much of a fan of keeping pets in urban areas, but mostly because of the irresponsible owners who don't keep things in check with their pets.